This March, Fort Valley State University faculty, staff and students will recognize and celebrate the diverse and historic accomplishments of women by hosting“W.E. 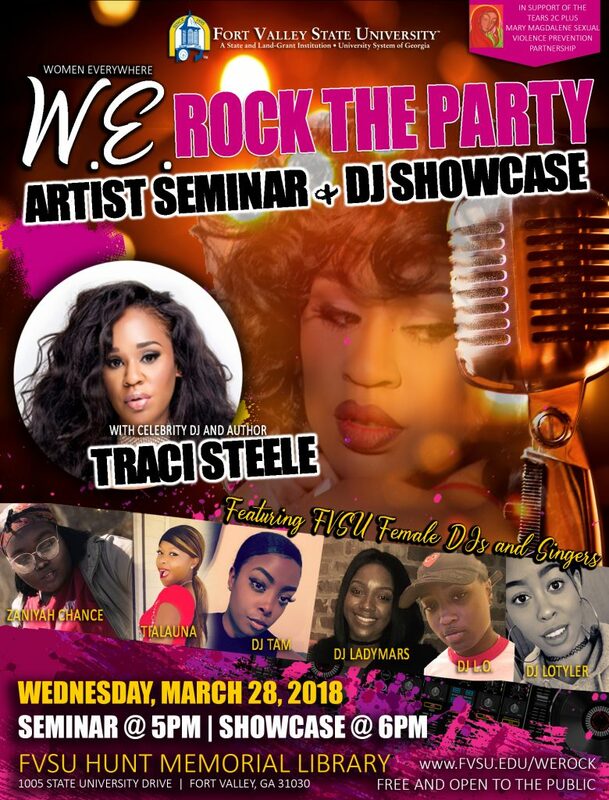 (Women Everywhere) Rock The Party Artist Seminar and DJ Showcase” on Wednesday, March 28. Celebrity radio personality and author DJ Traci Steele (http://tracisteele.com/aboutme.html) will be the guest speaker and the showcase host. The event’s purpose is to create a supportive community for student female recording and performing artists, and to provide a platform for FVSU’s Department of Visual and Performing Arts and Media Studies’ students gain exposure and performance experience. During the Artist Seminar, Traci Steele will share her perspective on entrepreneurship and gender inequality in the music industry; and encouraging women to support one another through peer mentoring. She will also discuss her new book, fashion line, and overall career as a radio host and DJ. Students will have an opportunity to engage in a Q&A session. During DJ Showcase, a total of four female student DJs will spin to four different categories, displaying their creative musical style. The event takes place outdoors. Sponsorship provided by the TEARS 2C Plus Sexual Violence Prevention Partnership.